Recent years have seen growing academic interest in England’s colonial venture in Tangier in the late seventeenth century, and the crucial role it played not only in influencing contemporary domestic politics in England, but also in shaping new imperial policies in the Mediterranean. This critical edition presents a remarkable collection of 18 Restoration pamphlets dealing with the English occupation of Tangier. In an extensive original introduction, Karim Bejjit narrates the various stages of the colonial venture in Tangier, and critically analyses both the British historiography and current scholarship on the subject. He provides an alternative reading of the Tangier episode, emphasising the Moroccan point of view and the significance of the local political agency. 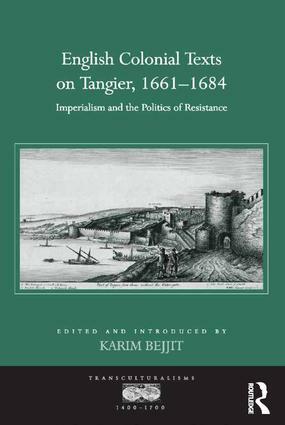 At the same time, as the author argues in the introduction, so intertwined were the affairs of the colony and the home country in 1680 that the political crisis which was then unfolding in England cannot be fully explained without acknowledging the impact of dramatic developments in Tangier. Despite their generic diversity, as Bejjit shows, the pamphlets in this collection share a common interest in the affairs of Tangier, and reflect the changing circumstances and shifting politics at home and in the colony. In bringing together these long forgotten narratives, this edition revives critical interest in the colonial adventure in Tangier which had considerable influence on the political scene in England. Read collectively, the texts offer a genuine glimpse into the colonial scene and the interplay of forces which governed English presence in Tangier.